College. The word alone elicits a vast array of images for me. Fall Saturdays spent getting ready for football games with my sorority sisters. My own smallness in a big, big world realized. Campus walks witnessing the stain-glassed landscape of people never before seen in my small town. Class skipping because I would rather meet friends for coffee. (What can I say? My addiction had to begin somewhere.) Writing courses humbling my every inspiration. Friendships solidifying through life decisions. Spiritually maturing beyond my wildest imagination, at least once I got my act together…College opened the doors of the world for me. It also showed me the world is not enough. I remember the anticipation that would build up before college frat parties or my sorority events. While I was always the designated driver, my sobriety didn’t prevent my stupidity. I think back to those moments in my life and realize even then the emptiness I felt. While brief snapshots of excitement existed, I’m not sure I ever really enjoyed those parties. I look at my former self and do not see a girl filled with joy, but rather I only see brief moments of amped up adrenaline that cannot be defined as happiness. Maybe it’s because I knew better, or maybe it’s simply because those moments of thrill were never enough. Do you ever wake-up feeling as if each day is the exact same as the one before? For some, the routine is a security blanket. For others like me, it seems to be a joy-squelcher. If there has ever been a movie that inspires incoherent fits of rage within me, it is the movie Groundhog Day with Bill Murray. His character is doomed to repeat the same day over and over again. I cringe violently because Groundhog Day plays out in my own life more times than I can seem to count. Monotony is a scary place for me to be, and it is sometimes all the world offers. And the world is not enough. There are days when I wake up thrilled to be with my students. To see what life-decisions they are making. To help them find their way. To answer their questions. To love them through very real and painful struggles. Other days, it is the deepest of battles to leave my own children for the sake of 150 others. And there are days when it’s just outright hard to teach. I could do cartwheels and my students wouldn’t notice. There are class periods in which I ask deep, life questions, and the only thing I hear is the sound of crickets from a nearby field. If my feelings of self-worth were wrapped up in the teens I teach, I would be in trouble because although I love them, my students are not enough. Last fall I bought a beautiful dark eggplant-colored sweater. I probably spent too much money, but it fit me perfectly. I was so excited because it was versatile and flattering. After I had worn it the first time, I threw it into the wash without reading the instructions. The phrase hand-wash only never made it to my eyes. Yep. Tiny fuzz balls surfaced all over the sweater. It is now only a fragment of the gorgeous sweater it once was, and hangs in my closet to serve as a reminder of the article of clothing in which I had once placed so much joy. The sweater failed my expectations. It reminds me that my material possessions are not enough. How often are we failed by people? Yet how often do we place our reason for living in the hands of another? When I was facing adolescence, my heart would sink or soar based upon the friendships and dates I had. Even as I have aged, I sometimes look for my dear friends and family to fill my cup—my need to be loved and accepted. But no matter how much I love these amazing humans beings, they will fail me. I will fail them. People are imperfect. We cannot ever be enough for each other. Relationships are simply not enough. I think at the deepest levels of the heart, humans crave complete acceptance. We look to empty parties, stressful jobs, broken people, financial security, and so many other shallow holes to fill the enormous gap in our hearts that desires love and full acceptance. But what we find is that those things are never enough to fill what we know is missing. Our search is in vain. Ecclesiastes 6:7 says, “All man’s labor is for his stomach, yet the appetite is never satisfied.” It’s a rather bleak picture, isn’t it? So what now? Blessedly, there is One who is enough. One that can fill our deepest longings and bring us complete joy. His is love is perfect, and His acceptance is without favoritism. 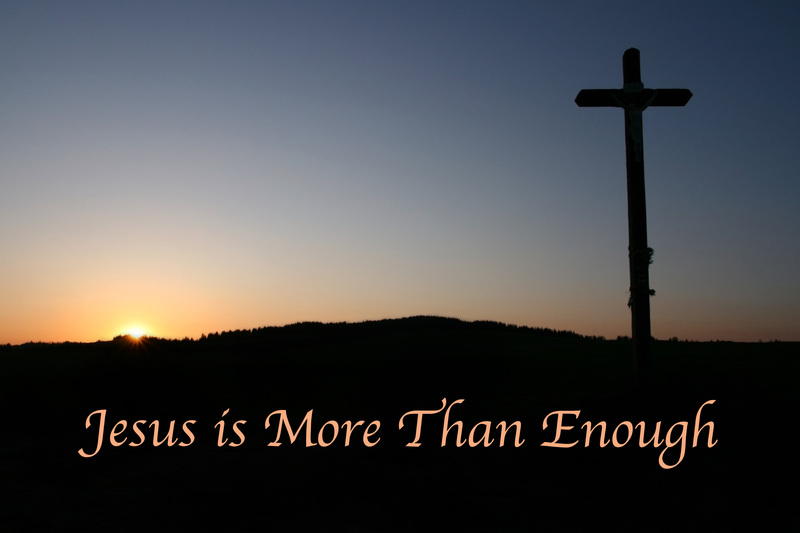 My Jesus is enough. He is enough to meet us in the darkest corners of life. Knowing that Christ is enough does not ever guarantee our journey will be easy and trial free. No. Life is hard, with or without the Lord. But He alone is enough to get us through those trials and painful journeys. Dear friends, the world is not enough. But joy, oh joy! Jesus Christ is. This entry was posted in Relationship with God and tagged enough, God, Jesus, Joy. Bookmark the permalink. Thank you. You have such a gift in writing! By the way were you a Kappa Delta?